I think that as you get older you become a little more cynical about the world and its people. All right, as I get older I’ve become more cynical, shall we say even more cynical, then? You see, I don’t believe that people are capable of just leaving things alone. The longer things have been lying around, the less, I believe, is our chance of ever knowing what it was originally intended for. We set out, the other day, to find Little Salkeld Watermill where we believed we would find coffee and cakes. It took us a while to find – but then Cumbria is a lovely place to wander around in. The coffee and cakes were gorgeous. We had decided on Little Salkeld Watermill because we also believed that we would find Long Meg and her daughters nearby, and so we did. First the facts. Michael Scot, a very clever Scotsman who lived around 1200, and who everyone knew was actually a powerful magician, happened to be passing and came across a coven of witches, (Long Meg and her daughters in this case) so naturally, he turned them into stone. As you do. Now, on to the more uncertain history of the stones. They may be somewhere between two and five thousand years old. They are built near Eden River. (What a surprise. We are moving massive blocks of stone around and we choose, as their final resting place, a nice flat place by the river we floated them down on.) There are many people who think that over the last five-odd thousand years there have been no changes and that we may be able to work out what use the original constructors intended for the circle. I think we need another magician. 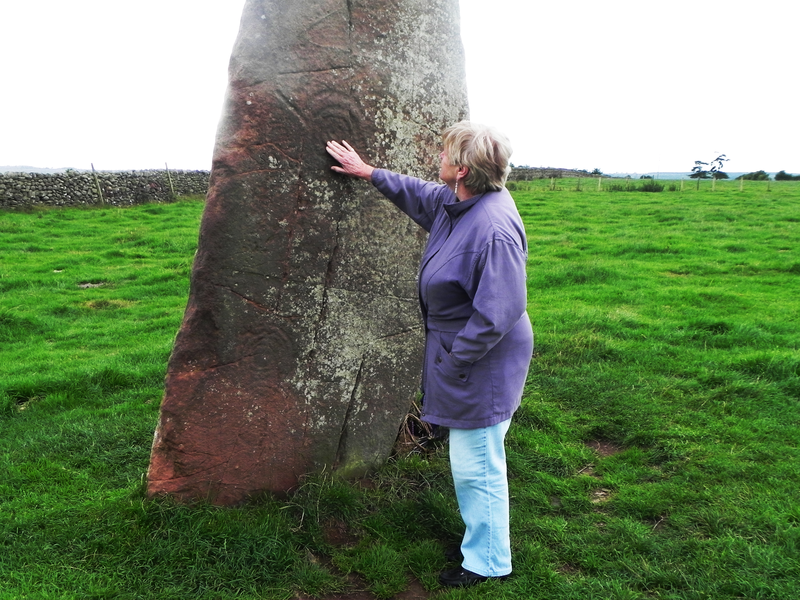 By the way – the photo shows My Sister and Long Meg – you can decide which is which.